Producer Sandip Singh’s latest film PM Narendra Modi is embroiled in a controversy after Javed Akhtar expressed shock at getting credit for a song in the biopic. Apart from Mr. Akhtar, another veteran lyricist, Mr. Sameer, had said that he was surprised to find his name in the credits. However, Sandeep Singh was also in news exactly a year ago. Singh, was named in a sexual assault report for allegedly assaulting a minor boy from Switzerland at a Mauritius hotel in April last year. The boy was on a holiday with his family and was staying at the same hotel as Singh. The Bollywood producer had visited the island nation in the Indian Ocean to scout for locations for his upcoming movies. As per a report published by DNA, he apparently befriended the boy at the hotel’s beach, and talked about movies and music while walking along the beach. It was later reported that both went to Singh’s room where he forced the boy into the act. Somehow, the minor lad managed to escape and later narrated the incident to his father. The family had then rushed to the hotel reception but could not find any security staff around. The father reportedly tried to apprise the staff at the premises, however, the hotel management did not pay any heed to the incident. Singh reportedly left the hotel soon afterwards. The victim’s father had mentioned in his report, that the incident took place on March 29 between 11.30 am and 12.30 pm in Room 221 at the Beachcomber Family Hotel, Troux aux Biches, Mauritius. Singh was said to have flown out on March 30, by an Air Mauritius flight at about 9.30 pm. Sandeep Singh was contacted by DNA who had published this story, but he did not respond to their calls or text messages till the time of going to press. In many ways the biopic on Prime Minister Narendra Modi seems to violate the code of conduct. 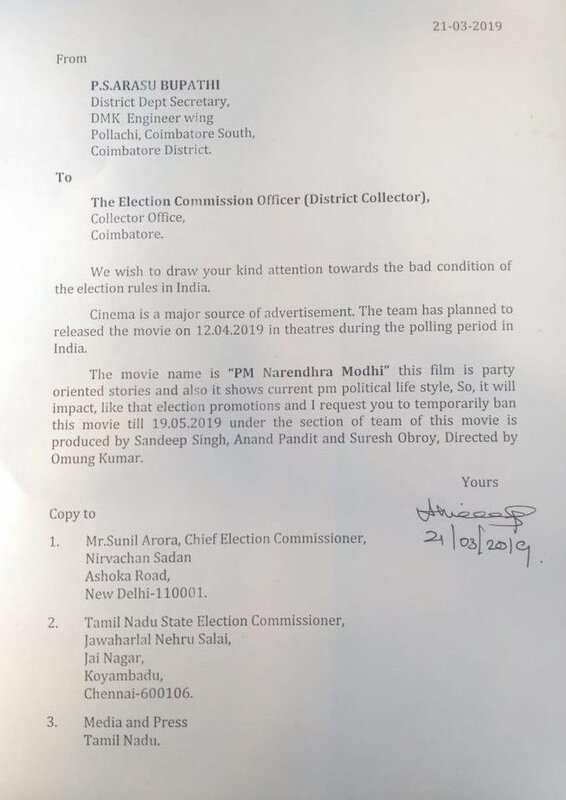 The DMK has filed a complaint with the Election Commission against this movie, seeking that the release of the film be deferred since it may ‘impact election promotions.’ The movie, which is titled PM Narendra Modi and stars Vivek Oberoi in the lead role, is scheduled to hit the screens on April 5, a week before the first phase of the 2019 Lok Sabha Elections. Singh has also co-produced films like Aishwarya Rai Bachchan starrer ‘Sarbjit’ and Sanjay Dutt starrer ‘Bhoomi’. Previous articleKerala: Country made bomb explodes in RSS functionary’s house; Was a terror attack underway?